The Project 22800 Karakurt-Class guided missile corvettes are being built for the Russian Navy. Image: courtesy of Almaz CMDB, JSC. The keel-laying of two Project 22800 corvettes, Uragan and Typhoon, was held in December 2015. Image: courtesy of Almaz CMDB, JSC. The Karakurt-Class corvette Uragan (251) was launched in July 2017. Image: courtesy of Pella Shipyard. 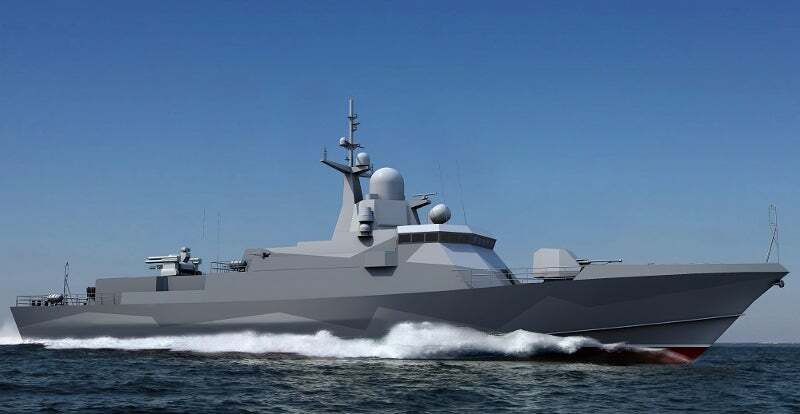 The Project 22800 Karakurt-Class guided-missile corvettes are currently under construction for the Russian Navy. The small corvettes are intended to conduct anti-surface and anti-air warfare, as well as coastal surveillance missions in littoral zones. The keel for the first corvette in class, Uragan (251), was laid at Pella Shipyard in December 2015. The vessel was launched in July 2017 and is scheduled to enter service in 2018. The keel for the second vessel, Typhoon (252), was also laid in December 2015, while the keel laying ceremony for the third corvette, Storm (254), was held at Morye Shipyard in May 2016. The remaining vessels in class, namely Shkval, Burya and Okhotsk, are also under construction. A total of 18 Project 22800 Karakurt-Class corvettes are to be included in the Russian Navy’s Black Sea Fleet and Northern Fleet by 2022. In August 2016, JSC "Zelenodolsk Plant named after AMGorky" was awarded a contract by the Russian Ministry of Defence for the construction of five Project 22800 corvettes for the Russian Navy. The Russian Ministry of Defence signed agreements with Pella Shipyard and Zelenodolsk Plant during the International Military Technical Forum "Army 2017" for the construction of a series of Project 22800 corvettes. Designed by Almaz Design Bureau, the Karakurt-Class features a stealth superstructure housing an integrated mast mounted with phased array radar panels. The platform is designed to offer high manoeuvrability, stability and sea-keeping capabilities. "The ship will be installed with advanced command and control systems, navigation and communication facilities, as well as state-of-the-art weapons." The modular design of the ship allows for the development of multiple variants to meet the mission-specific requirements. The ship will be installed with advanced command and control systems, navigation and communication facilities, as well as state-of-the-art weapons. The Project 22800 corvette measures approximately 67m-long and 11m-wide, and has a displacement of 800t. The primary armament of the Karakurt-Class will be Kalibr-NK cruise missiles fired from an eight-tube UKSK vertical launching system (VLS). The Kalibr-NK missile can engage long-range targets within the distance of approximately 2,500km. The corvettes will also be armed with the Pantsir-M missile and anti-aircraft gun complex. It is a naval variant of the Pantsir-S1 combined surface-to-air missile (SAM) and anti-aircraft artillery system developed by KBP Instrument Design Bureau. The main gun mounted on the forward bow deck will be an AK-176MA 76.2mm automatic gun, which is an upgraded variant of the AK-176 naval gun. It can fire at a rate of 150rpm and can engage targets within the maximum range of 15km. Its AK-176MA will be housed in a multifaceted turret to deflect electromagnetic waves. The gun will integrate a digital control system and Sfera-2 optronic station to acquire multiple targets at long ranges. The corvettes will also be mounted with two AK-630M 30mm close-in weapon systems (CIWS), which can strike aerial and surface targets such as anti-ship missiles, aircraft and helicopters, as well as small-size surface vessels, floating mines, and shore-based fire posts. With a rate of fire of up to 5,000rpm, the CIWS will enable the vessel to engage targets within the range of 5,000m. Other armament aboard the vessel will include two 12.7mm Cord machine guns. The power plant of the Karakurt-Class will integrate three M-507D-1 diesel engines and three DGAS-315 diesel gensets supplied by PAO "Zvezda". The propulsion system will enable the ship to attain a maximum speed of 30kt and a range of up to 2,500nmi. The endurance of the corvette will be approximately 15 days.